As I stated in my last post I have developed an element of my daily practice on Perfect Nature in Book 3, Chapter 6 of the Latin Picatrix. "Meegius" visualize a light before me. "Betzahuech" visualize a light behind me. "Vacdez" visualize a light to my right. "Nufeneguediz" visualize a light to my left. Invariably, over course of continuing the invocation 10, 20, or more times, the visualizations will change as I explore the nature of each of the spirits. Meegius before me. Over time this has developed into an image of a point expanding, often blue, and ossified like bones radiating from a central point. As spirit of the East he is the spirit of things rising into existence. Betzahuech behind me. Betzahuech appears as a dark and hidden spirit, one that I cannot see, a face behind a veil. He is the universe imploding into a singularity. As spirit of the West he is the spirit of things diminishing into obscurity. Color is black. Vacdez to my right. A yellow light. Two images I have received for Vacdez are a woman sitting in a straight backed wooden chair and a submerged city. As spirit of the South Vacdez holds one of the axles of heaven. Nufeneguediz to my left. This spirit has appeared to me as the rim of a ceramic jar, an edge that borders on emptiness. As spirit of the North he holds the other end of the axle of heaven. I'd like to ramble on a bit about chapter 6 of book 3 of the Picatrix. This is the section that contains the details of a working for making contact with spirits named the Spirits of Perfect Nature. It also describes the actual working method for the entire system of magic in the book. I believe it is one of the most important chapters in terms of working the magic of Picatrix. Let's begin a detailed look at this chapter. The first notable thing is that this passage, while somewhat different in its elements, appears in both the Latin Picatrix (G&W) and the Arabic Ghayat al Hakim (Atallah). For this discussion I will be drawing from the Latin, Greer and Warnock translation. Nothing in this science can be perfected unless the virtue and disposition of the planets are inclined toward it by their own nature. This is what Aristotle says, in the Book of Antimaquis where he says: Perfect Nature fortifies those who philosophize, and strengthens their intellect and their wisdom, so that in all their works they may quickly attain fulfillment. The chapter begins with an admonition that the magic of the Picatrix can only be learned if the planets are inclined. Then the next sentence tells us that the fortitude of the magician is strengthened by Perfect Nature. In Pingree's Latin edition the name is natura completa. While my Latin is terrible it would appear that in this context "perfect" means complete, full, highest, finished. Together these sentences are saying that Perfect Nature not only aligns the disposition of the planets toward the magician but also helps the magician in learning and understanding the magic. One of the manifestations of Perfect Nature, as noted in the footnotes of the G&W Picatrix, is a sort of Poimandres figure from the Hermetica, or spiritual assistant figure from the PGM. Everything belonging to this science, however, the wise concealed according to their degree, so that no one except a philosopher would be able to uncover it. They taught all knowledge and the subtleties of philosophy to their disciples before revealing to them the work of the spirits of Perfect Nature. They gave to the spirits of Perfect Nature these four names: Meegius, Betzahuech, Vacdez, Nufeneguediz, which are the four parts of the spirits of Perfect Nature named above. When those sages wished to speak about Perfect Nature, they called them by these four names, which signify the powers of Perfect Nature. This paragraph begins with another reminder that the meat and true meaning of things written about magic are concealed and written in riddle and code. The word "however" in the first sentence makes the meaning "even though you may have the assistance of Perfect Nature, everything is well hidden". By extension, it is safe to assume that this includes the material in the Picatrix itself. Then we are introduced to the Spirits of Perfect Nature themselves; Meegius, Betzahuech, Vacdez, Nufeneguediz. If I am reading this paragraph correctly these four names not only describe the names of the spirits themselves, but also the parts of Perfect Nature and the powers of Perfect Nature. This suggests that Perfect Nature is to be thought of a a unity, a single thing that is composed of four parts and each of those parts has its own name and "assignment". As an aside, I am still trying to research the derivation or meaning of each of the names but as of yet have found nothing. I have much more to say about these guys a little later. Hermes, however, said: When I wished to understand and draw forth the secrets of the workings of the world and of its qualities, I put myself above a certain pit that was very deep and dark, from which a certain impetuous wind blew; nor was I able to see anything in the pit, on account of its obscurity. If 1 put a lit candle in it, straightway it was extinguished by the wind. This is a very curious passage and strikes me as metaphorical. In this context Hermes is presumably Hermes Trismegestus, apparently one of the sources from which Picatrix was compiled. Standing over a pit of wind seeking answers to the world's mysteries seems like a description of the Oracle at Delphi. For those of you who are unaware, it has been suggested that the Oracle at Delphi was able to attain her prophecies and visions from hallucinogenic gasses which issued from a small chasm in the floor of the chamber, over which she would stand. In this case, instead of being a source of vision, however, the wind is an impediment to knowledge as is the darkness of the pit. Would it be a mistake to imagine that it is the mind of the magician that is being discussed here? This was all written hundreds of years before Jung wrote his theories of the unconscious but it seems that is what is being described. The darkness of the pit is the obscurity of the unconscious or the "other side" of the spirit realm. The candle is the meditating and seeking consciousness of the magician. The impetuous wind could then be understood as the chattering of the conscious mind, always interrupting and disrupting concentration. Then there appeared to me in a dream a beautiful man of imperial authority, who spoke to me as follows: "Put that lit candle in a lantern of glass, and the impetuosity of the wind will not extinguish it. You should lower the lantern into the pit, in the middle of which you should dig; thence you may draw forth an image by which, when you have drawn it forth, the wind from the pit will be extinguished, and then you will be able to hold the light there. Then you should dig in the four corners of the pit, and from there you may draw out the secrets of the world and of Perfect Nature, and its qualities, and the generation of all things." Presumably this beautiful and imperious man is a manifestation of Perfect Nature who comes in a dream vision to help Hermes to figure out how to extract answers from this pit. As the figure arrives in a dream, is it too much of a stretch to consider the entire episode, the pit, the lantern, the wind, as a dream? In this passage we also have another presentation of the number 4. The Picatrix is replete with the concept of correspondences. In another section of the book it explicitly states that natural groups of four (elements, seasons, moon phases, directions, humors, etc.) are related and correspondences can be drawn between the various groups. For example earth, winter, black bile, melancholy, the New Moon, and the southern direction can all be said to draw upon the same qualities. So now we have 4 spirit names and 4 corners of the pit. This is the first indication that the names of Perfect Nature correspond to the compass directions. There are more explicit examples later. From the four corners of the pit are drawn the secrets of the world (macrocosm, above) and of Perfect Nature (microcosm, below). Also "its qualities" with "it" being somewhat ambiguous and perhaps referring to both the world and Perfect Nature as one "it". I asked him who he was, and he replied: "I am Perfect Nature if you wish to speak to me, call me by my proper name, and I will answer you." I asked him them by what name he was called, and he answered me, saying, "By the four names mentioned above I am named and called." I asked him next at what times I should call him, and how I should make the invocation. Here again we are reminded that Perfect Nature is a unity of four parts. Here it is made clear that the Spirits of Perfect Nature are invoked using the names Meegius, Betzahuech, Vacdez, Nufeneguediz. Because of this and because of the importance I put on this chapter I have developed a practice of invoking the names as part of a daily practice. He said: "When the Moon is in the first degree of Aries, be it by day or by night, whenever you wish, go into a house that is clean and splendid, in one corner of which you should put a raised table on the floor, toward the eastern side. Take four pitchers (each of which should have a capacity around one pint). Into one of them put cow's butter, into the second nut oil, into the third almond oil, and into the fourth sesame oil. Then take four more pitchers of the same size, and pour wine into them. Then make a composition of nut oil, butter, honey, and sugar. Take the eight pitchers and the mixture you have made, and a glass vessel; put this latter in the center of the table, and put the composition you have made into it. "Next put the four pitchers full of wine at the four quarters of the table, arranging them in the following way: the first pitcher in the east, the second in the west, the third in the south, and the fourth in the north. Then take the other four pitchers; first put the one full of almond oil to the east, then the one full of nut oil to the west; the one full of butter goes to the south, and the one full of sesame oil to the north. Then take a burning candle and put it in the midst of the table. Then take two thuribles full of burning charcoal, into one of which you shall put frankincense and mastic, and into the other aloes wood. "T call to you, O strong, potent, and exalted spirit, because from you proceed the knowledge of the wise and the understanding of the intellect, and by your virtue the desires of the wise are accomplished, that you may respond to me, and be present with me, and unite with me your powers and the virtues that accompany you, and strengthen me with your knowledge so that I may understand that which I do not understand, and know that of which I am ignorant, and see that which 1 do not see; and remove from me all blindness, turpitude, forgetfulness and infirmity; and lift me up to the degree of the ancient sages (those, indeed, whose hearts were filled with knowledge, wisdom, understanding, and cognition), and affix the aforesaid things in my heart, so that my heart may be made like the hearts of the ancient sages.'" He then said: "And when you have done the foregoing working in the aforesaid way, you will see me." This working is described in the Book of Antimaquis. The ancient sages used to perform this working every year for the sake of their spirits, so that they might put in order their Perfect Natures. When this was done, they used to feast together with their friends on whatever on the table was nearest to them. In this part of the chapter we have the actual Ritual of Perfect Nature itself. The ritual not only tells how to call upon the spirits and what they enjoy as offerings it also gives us a structure of correspondences. What we do not have, however, is the elemental correspondences that fit this structure. It is tempting to use the compass directions to facilitate that line of thinking but I am prevented from doing so for two reasons. First, I have yet to find evidence in the pages of the Picatrix for such. It can, however, be inferred using the Zodiacal wheel. Each of the first actions happens toward the East and the rite is to be performed when the Moon is in the first degree of Aries. Therefore it is not too much of a stretch to suggest that Fire is in the East and attributed to Meegius. This would make Betzahuech and the West attributed to Air (Libra), Vacdez and the South as Earth (Capricorn), and Nufeneguediz as North and Water (Cancer). But so far this is simply a theory until I gather more evidence. The Second reason I am cautious to set elemental attributions to the directions is because there are various schools that all suggest theirs is the correct way and all differently. In my favor, however, both Jake Stratton-Kent and Henry Cornelius Agrippa attribute the elements to the directions as I have suggested here. This is a good place to break our discussion into smaller bits. This first section has much valuable information. There is an equal, if not more, valuable information in the second half. For this article I assume you know what the Picatrix is, but for those of you who do not I will give a very brief description. Those in the 200 level class can skip ahead. The Picatrix is a book thought to be first compiled in the 9th Century CE in Arabic under the title Ghayat al-Hakim, The Goal of the Wise (or Aim of the Sage depending on your translation) from, the text claims, over 200 other books. It remained in Arabic until 1256 when it was translated into Latin and Spanish by scholars in the court of Alfonso, King of Castile. The Latin version bears the title Picatrix and is essentially a book of astrological magic, working with spirits associated with the planets and stars, through the use of talismanic objects called "images". The word Picatrix shows up in the book itself as the name of a contributor, the name of the author, and the name of the book. The copy and version I refer to the most is the translation of the Latin Picatrix by John Michael Greer and Christopher Warnock (2010). 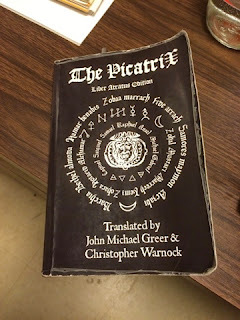 The Picatrix was a book that came to me a little over three years ago. I first heard about it on a podcast by Poke Runyon, The Hermetic Hour, and picked it up soon after. I was initially intrigued because it was described as a manual for talisman making and using images in magic. As an artist this really piqued my curiosity. I was (and still am) excited to make pieces of art with a magical dimension to them. Also at the time I was floundering a bit magically. I was looking for an alternative to the traditions of the Victorian Era; Thelema, The Golden Dawn, Gardenarian Witchcraft. In terms of practice, none of those have ever sat quite right with me for various reasons. Most of the material I could find that purported to teach magic were based on these foundations. And, being a hermit, I definitely wanted to be solitary which meant figuring out everything on my own. The Picatrix was the first book I had found that had Hermetic style magic without heavy influence of Christianity or Hebrew Qabalah. The Picatrix was the book that got me off the proverbial Armchair. I like the Picatrix because it is different; different from almost all contemporary books on magic (or magick) and a different way of thinking about cosmology. I generally glaze over when discussion of the Tree of Life comes up. I like the Picatrix because it is complex and cryptic. After three years I am just now feeling like I am getting a grip on the material. Part of the attraction is that it is deliberately written cryptically in riddles and illusions. The text, in fact, explicitly states this fact. There are blinds and fake-outs that may or may not be accurate. There are vague descriptions, code words and phrases, and beautifully written imagery. Things are not necessarily what they seem. I like the Picatrix because it is not dogmatic. There is a lot of room for the magician to use his or her own imagination. There is also no set morality and workings for manipulation and destruction are next to workings for prosperity and good will. I like the Picatrix because it is spirit based. I am of the school of thought that magic works through the agency of spirits (as opposed to the two other camps, that magic works by the agency of the magician's will or through the ability to move "energy" in the universe). I don't do magic to get stuff or, as it is stated elsewhere, to get paid and laid. I do magic to explore subtle realms and communicate with spirits. Picatrix fits this attitude well, at least for me. Lastly, I like the Picatrix because it is not a beginner text. It is a book that I'm sure I will continue to explore for years. Being a hermit has advantages and disadvantages. On the one hand it protects me somewhat from the dogmas of traditions according to a guru. But, on the other hand, I have to work out many things myself. This reconciliation of astrological spirits with elemental/chthonic spirits feels like one of those situations in which I struggle to figure it out but feel that others are already way ahead. Ultimately it doesn't matter. I know myself well enough to know that I would instantly distrust an answer I obtained easily. I subscribe to the concept that all of this magic stuff is strongly subjective and personal and I am almost never satisfied with someone else's answers. At any rate, I have a few more thoughts on a unified cosmology that includes the astrological spirits and the demons of the grimoires. Astrological timing figures heavily in Verum and so exists as a tool to the practice. It is not replaced or diminished. The spirits of the grimoires are essentially elemental. This is an argument presented by Jake Stratton-Kent in his Encyclopedia Goetica series that I feel he has expressed sufficient evidence to support. Being elemental the grimoire spirits are therefore sublunary and subject to astrological weather as humanity is. A question about this, however, is: are the sublunary grimoire spirits subject to "generation and corruption" as other things in the world or are they not part of the material world and therefore exempt? Perhaps by virtue of being elemental? As I see it there are three basic choices. First, I could see the two hierarchies as distinct systems, ignoring one for the other. I have already discounted this idea. Second, I can work two systems and practice them simultaneously; each with its own rules and practices. I tried this for months and it is cumbersome to maintain. What wound up happening was that one supplanted the other and I began to stagnate with indecision until I just dropped everything. For me, kept separately they kind of canceled each other out. Or there is the third choice which is to combine the two systems into a melded whole. This is the path I am already headed down. There are a few avenues for this line of thinking. The first, again from Jake Stratton-Kent's Encyclopedia Goetica, is a pretty exhaustive listing of possible astrological correspondences to the demons of the Grimorium Verum. Or I could do as Jack Faust describes in his blog, ascribing chthonic manifestations to the seven planets. This, however, may be a less than ideal example and strikes me as simply putting skull masks on characters. Obviously I still have a lot of work to do on the subject. And work as opposed to theorizing. Combining the Picatrix and the Grimorium Verum into a cohesive working whole seems to be the task set before me. Time to get to work. Past time. I made a classic mistake and now it has me thinking about the nature of making requests of spirits. The incident has a good side and a not-so-good side. The good side is that I made the request as a part of the Astrachios Prayer and it was granted. The not-so-good side is that the realization of this request set me back in my magical practice a bit. I asked the spirits for safe, reliable access to a certain illegal substance of which I am quite fond. A few weeks later I had that access in what I am sure is direct intervention by the spirits. I was elated. Not only was it cheap, it was home delivered! It also indicated to me a certain amount of success in my very slow exploration of the Verum material. The problem turned out to be that, since I am so fond of this substance, I frequently indulged in it. Predictably (in hindsight) my focus and priorities changed and I slowly did less and less magical work and what I did do was erratic, weak, and infrequent. And now, months later I feel as though I've lost ground. Part of my mistake was justifying thinking "the spirits wouldn't give me anything that would impair my magical development". Surely if I am able to use magic to get what I want, then it is appropriate for me to get it. And further, that since it came at least partly from spiritual efforts it must in itself be spiritual. I took it as encouragement from the spirits that this substance was what I needed for the next steps of my spiritual development. I can work high, right? It turns out the answer is "not really". But perhaps that was the answer I needed. Making requests is no small thing and asking for a gun to shoot yourself in the foot is just as valid as any other request. The spirits are not here to coddle you. For the past several months I've been working with Jake Stratton-Kent's True Grimoire. I've been reciting the Astrachios Prayer (I'll be posting thoughts on this later) and gathering the tools for the ceremonies. I have yet to draw the First Character and begin that ritual process but I have been doing other things to build connections to the spirits. One of those things is to study, meditate, do divinations, and ask the spirits about their nature and their messages. Today I've been thinking about the Four Kings and how they fit into a framework that works for the mythology I'm building for myself. This morning's tarot reading was "What is the way for me to work with the Four Kings?" Study, learn, question your assumptions about the structure of the world and start again from scratch. I immediately began to write a list of the conceptual structure of the spirits of the universe, in order as I saw it. And this list seemed pretty good. And then it occurred to me in a palm-to-the-forehead kind of way that there was an obvious pattern here. As Above So Below. Seven planetary spirits versus Four Kings and three Chiefs. I made a new list. Now I'm not saying with this list that Belzebuth is the same as Jupiter or even that Jupiter correspondences would work for Belzebuth. But as soon as I wrote the list down some things made a great deal of sense. I had been having a difficult time not only reconciling my previous Astrological learning and my current inclusion of Verum spirits but also in incorporating the Four Kings and three Chiefs into a unified whole. These two separate and distinct lists are reflections of each other. Saturn and the King of the North are two separate individuals yet they share some qualities. The sphere of Fixed Stars encompasses all things and the Elements comprise all things. As you will note I have left off God and Time as I felt they were somewhat beyond or separate from this reflection idea. The next puzzle for me to work out will be the specific names for each of the Kings based on the elemental/directional attributions. There is a lot of conflicting information in this regard. I tried asking Scirlin about it using coin toss method, but I got conflicting information from him as well. Since I've been paying close attention to the Mansions of the Moon I have learned a couple of things. I am noting them here as a sort of record and note keeping. As more items come up I will make more posts. 1. The Moon moves faster at the New Moon and slower at the Full moon. At the Full Moon the Mansions turn in the evening and last something like 25 or 26 hours. At the New Moon the turn happens in the middle of the night and and lasts something like 19 or 20 hours. 2. Because of this sliding length of the Mansions they slowly rotate through the days of the week.Therefore the Mansions do not have set planetary attributes as I've seen suggested elsewhere. In an effort to plan formal evocations of each of the spirits of the Mansions I investigated where the Moon was at each Monday during the hour of the Moon. I found that over the course of several months the Moon stations in all the mansions during the second hour of the Moon on each Monday. 3. Not so much as something I've learned but a suspicion that the spirits of the Mansions or not necessarily lunar. Perhaps it is akin to the solar zodiac signs not being necessarily solar. I will need to contemplate this further. Wow, it's been three months since my last post. That seems about standard in my attention/distraction cycles. Since my last post much has happened. I have not done any more evocations as such. But I have moved to a more stable home with my partner, i've worked more with the spirits of the Mansions of the Moon, I've read Geosophia and the Grimorum Verum by Jake Stratton Kent (sparking many ideas), and we got a dog. Is it the work of Jophiel? Perhaps. At any rate, life is good. There are, of course a few things that are needing attention. My art making has been somewhat fallow the past several months. Now that I have moved it is starting to come back to me. I'm starting to feel a bit burnt out by my day job. Very soon I will need to make peace with it or figure out some kind of exit strategy. And I will need to figure out a way to do magic in a shared space. My partner is ok with my occult activities in an abstract sense but she's not yet walked into a house full of incense smoke from a full on evokation ritual. So, the work I've been doing lately has consisted mostly of prayers and contemplations of the Spirits of the Mansions of the Moon according to the Greer/Warnock Picatrix moving toward their evocations. Also I've been thinking about the workings in the Grimorum Verum.